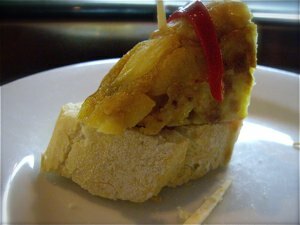 One of my favourite foods is pintxos, the bite sized Basque tapas. I was introduced to it at Bilbao Berria in Barcelona, and I was thrilled to find that Sitges had at least two pintxos restaurants. Izarra is a -hole-in-the-wall bar and eatery in the old part of the city where you may take a cold beer and tuck into a few of these delicacies. Having lunch here is a good idea during the hot Spanish summer, as the streets of the old part of the city provides much welcome shade to the beach guests. Visiting Izarra involves no waiting time, except waiting in the line to be served. Here you just ask in Spanish (other languages poorly understood), or just point on what looks tempting. Be prepared that what you choose may involve some surprises, as you always at least end up with something other than you expected - but it is always delicious. You never have to wait long, and you can order more if you are still hungry. 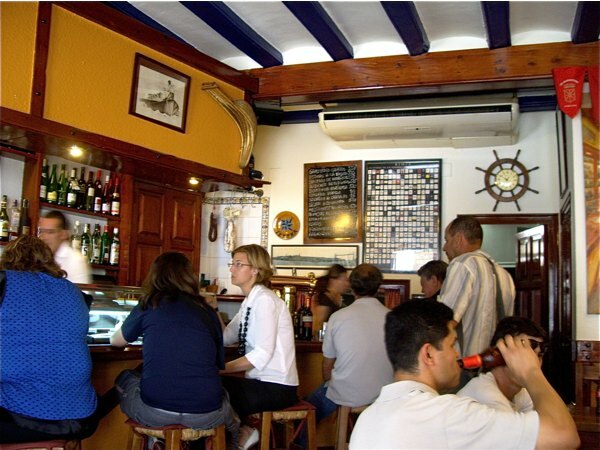 Many of the hole-in-the-wall pintxo restaurants are just that, small, dark, and filled with tables and chairs. Izarra has bucket loads of charm, but is rather cramped and uncomfortable for guests - definitely not for those of you suffering from claustrophobia - or bad backs. The chairs are small and may be uncomfortable to many of you, and you are very close to your fellow guests. Such interiors has its charm, as this is a place for locals and tourists alike. I love both spicy Spanish chorizos and their croquetas. The latter are made from thick bechamel sauce flavoured with cheese, cured ham or shrimps. When cool the stew is shaped into small dumplings, dipped in breadcrumbs, then fried in hot oil. While the chorizos are rich and spicy, dripping in olive oil, garlic and pimentos, the croquetas are delicious - crisp on the outside and beautifully soft and creamy on the inside. At Izarra you get the best of both - served on a bun. Tortilla is the famous Spanish omelet, served at every good tapas restaurant. Sliced potatoes, onions are fried, eggs are added and fried until golden. At Izarra you get one slice of tortilla, standing on end with a stick pushed through and fastened to a slice of baguette. 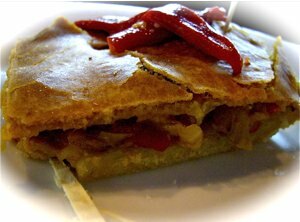 The fish and onion pie is a tapa, more than a pintxo, as it is served without the characteristic thick slice of bread. Delicious pastry with a delicious sweet and salty fish and onion filling. 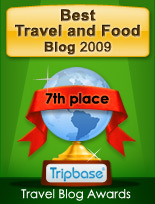 I have tasted pintxos with manchego cheese with different tastes. Chili and orange marmalade, or honey and nuts are ideal tastes to this delicious matured cheese. 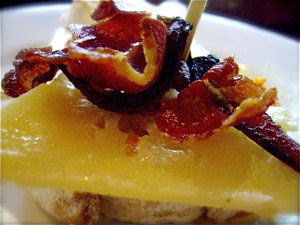 At Izarra I treated myself to a pintxo with a thick slice of cheese and with a slice of crispy bacon pinned to it. A delicious combination of textures and tastes. 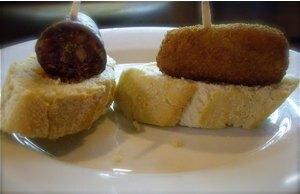 Many pintxos are served with one out of several mayonnaise based salads. Some are made with peas, eggs and ham, other with shrimp and mayonnaise. 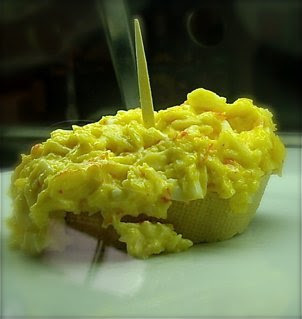 This delicious heap of egg salad was piled on top of a baguette slice in such an abundance that it had started to fall off. 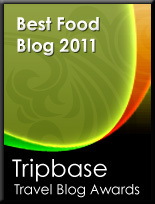 Delicious creamy consistency, with a mild rich taste of mayonnaise and hard boiled eggs. Comfort food. 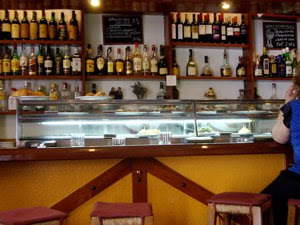 A small restaurant in downtown Sitges. Great for a quick and inexpensive lunch. Not much comfort to talk of but even more atmosphere and great food. One of two very good places in town to eat pintxos.